Poet Mackenzie Berry: The poem has so much imagery that I thought it would be fitting to pair with a visual artwork. I immediately thought of submitting it to Broadsided because there is no better public home for an ode to the color red than Broadsided. Broadsided’s mission of putting poems and visual artwork out into the world also excited me. I love art that interrupts and disrupts and invites stillness. Artist Kara Page: What initially drew me to this poem was the contrast between Berry’s images, the positive mixed with negative. The color red in general is seen as an angry color, but Berry gave it a depth that made me want to explore it in paint. Rather than focusing on the negative aspects of red I wanted to showcase red in a more gentle light. Describe your dream “vectorization”—where,in your wildest dreams, would you most like to see this broadside posted in the world? 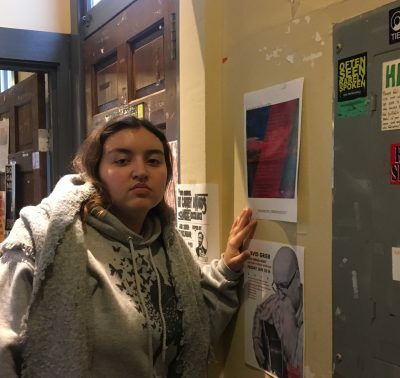 Poet Mackenzie Berry: I can’t pinpoint any specific, physical location, but I would like to see it placed as far from Louisville, Kentucky as possible just to see how far my hometown can stretch. What did you think an artist would pick up on from your poem? Did the visual artist refract any element of the poem that made you see the poem differently? Poet Mackenzie Berry: I knew the artist would sit with the color red and how it would or would not play in the visual piece. I wondered if the artist would make the color red the centerpiece and if the artist would represent any particular image in the poem. The artist represented nuance so well. 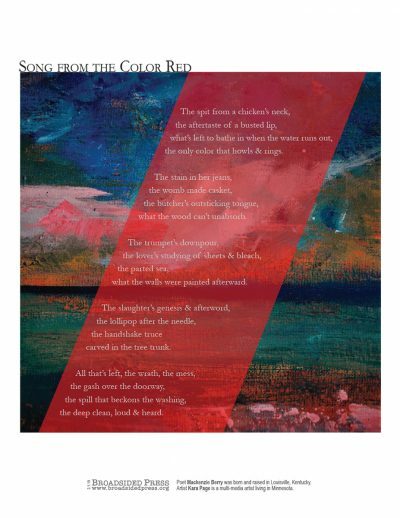 The abstractness of the piece seems to encompass all the images in the poem with the color red running throughout, so I suppose the artist made the images in the poem seem cohesive and of the same body. Artist Kara Page: I definitely wanted the color red to be a part of this painting given the title of the poem, but a simple red painting didn’t feel right. I wanted the depth of the painting to match the depth of the poem. One specific image that stuck out to me as I painted was the Red Sea. Despite the fact that the Red Sea is known as such, it isn’t actually red. The reason it can look red is due to a type of algae that grows there. I wanted my painting to be reminiscent of that: something that might seem one way, but maybe the reality is something different. Hence the abstract take on a landscape. Poet Mackenzie Berry: The beauty and texture of the background struck me, as did the contrast of the blue and red. This poem was written in response to a prompt to write a blues song during poet and professor Amaud Johnson’s poetry workshop, and the original title of the poem was “Blues Song for the Color Red,” which was later revised, so I was gladly surprised to see blue be so present in the visual artwork despite the title’s revision. Have you ever written work that has been inspired by visual art (other than the color red!)? What was that experience like for you? Why were you inspired to do so? Poet Mackenzie Berry: I have experimented with writing ekphrastic poems, but I haven’t written any based on an artwork that are any good. It’s often difficult for me to separate from the artwork and let the poem live its own life because I don’t want to misrepresent the artist’s work even though I know there is room for many interpretations of a work. Usually portraits, isolation, and/or somberness draw me to a visual artwork. Artist Kara Page: In general literature fits into my life on a daily basis because I try to read every day and every sort of thing. What inspires me most to paint when I am reading is usually poetry. Poems can take on so many different forms, and the variety in them gives me all sorts of ideas for paintings. Even if I don’t end up painting after reading a poem, there are all sorts of things that get filed away for later inspiration. If this broadside were a type of weather, what would it be? Poet Mackenzie Berry: A quiet & distant storm. Artist Kara Page: Rain in the desert. Poet Mackenzie Berry: Don’t Call Us Dead, Danez Smith and always Nikky Finney’s Head Off & Split and Rice. Artist Kara Page: Just started reading We Are All Shipwrecks by Kelly Grey Carlisle. Poet Mackenzie Berry: The Virgin Martyr St. Cecilia, Kehinde Wiley and Zanele Muholi’s self portraits. Poet Mackenzie Berry is from Louisville, Kentucky. She is currently in the 10th cohort of the First Wave Hip Hop & Urban Arts Program at the University of Wisconsin-Madison and recently served as a Wisconsin Idea Fellow, Public Humanities Undergraduate Exchange Fellow, and Sophomore Research Fellow. She has been published in Vinyl Poetry and Prose, Hobart and Up the Staircase Quarterly. She organizes, creates documentary media, and facilitates writing workshops. Image: “Song from the Color Red,” 11″ x 11,” acrylic on canvas, 2019.